Many months ago I received a charm pack of Lotta Jansdotter’s new line, Bella, and made up this quilt top to show off a few of those squares. I outlined each in solid white and made a patchwork background out of many shades of turquoise solids and a few prints. As I looked at it, I worried that the background was a bit too busy and kind of overwhelmed the rest of the quilt. So when I contemplated the quilting, I decided to do a more dense quilting for the background and charm squares, leaving the white sections unquilted, hoping it would pop a bit from the background. 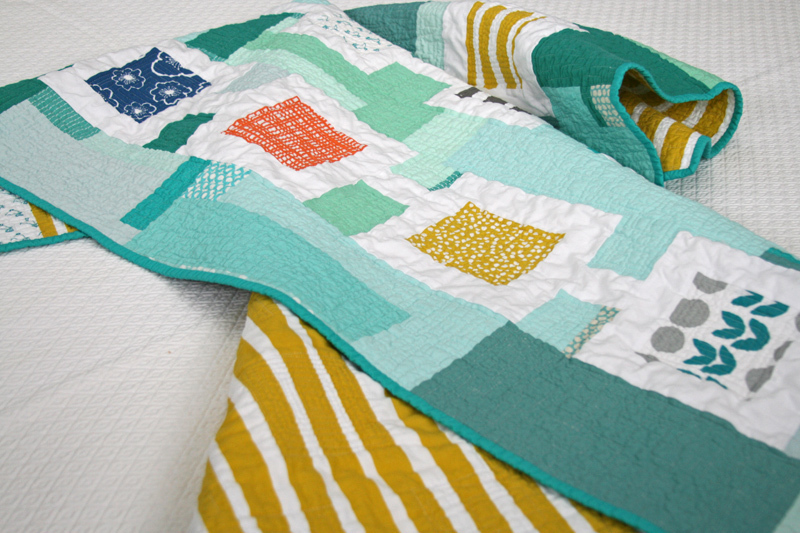 The backing is a stripe from the Bella collection, and the binding is a bit more turquoise with a spot of yellow. And in case anyone’s keeping track, this makes another finish off my ‘taking stock’ list… 8 done, 7 to go – at least things are moving in the right direction! 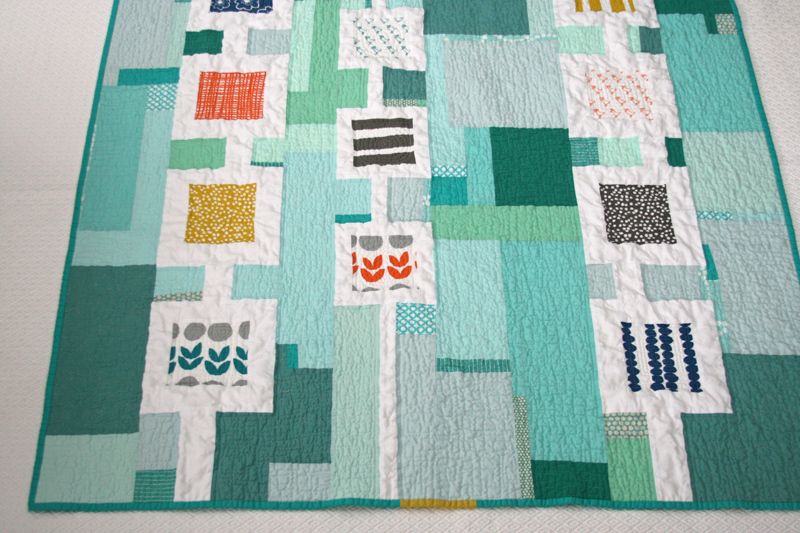 This entry was posted in [search] Wonky/Improv Quilts, baby, Posts about Quilts, Quilts and tagged baby quilt, bella, handmade, lotta jansdotter, patchwork, quilt, quilting. Bookmark the permalink. 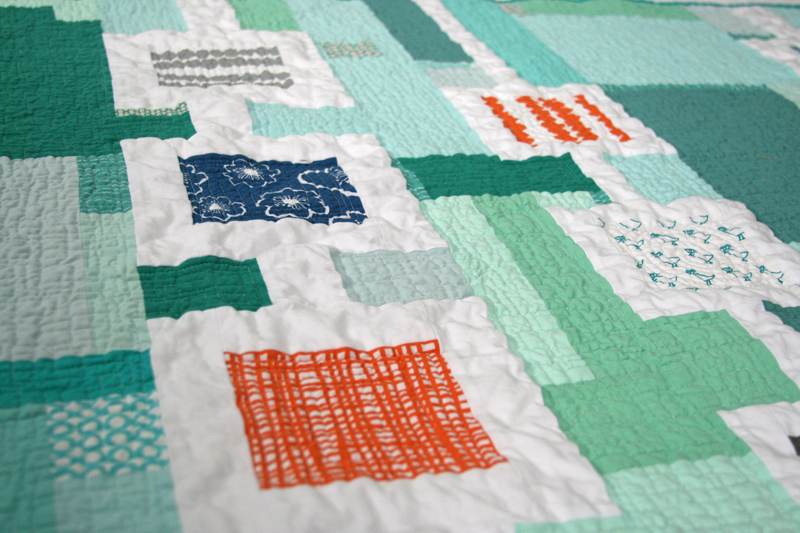 Thanks for your candid thoughts about the quilting. I like it very much because it looks extra crinkly and cuddly! So beautiful. The turquoise frames everything perfectly. I am not a huge fan of Bella (gasp, I know!) but your quilt is doing Bella justice. I love the background! I don’t think it distracts from the Bella squares at all 🙂 Beautiful quilt! Ashley, I love every single thing about this quilt. Every choice you made led to the creation of this most excellent (in my eyes anyway) quilt. The colors are superb, as is the overall design. Bravo! Cute. I love the backing you chose to go with it. 8 done, 7 to go! you are amazing! Tis beautiful! I love the varied tonal background and the squares do pop. You’re churning through the UFOs. I love it! I don’t think the background is overwhelming. 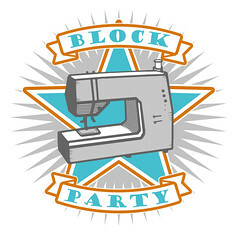 As the baby bear in Goldilocks said, “it is just right!” Congrats on branching out w/your FMQ. You are a brave woman…8-) Time for more pictures of Mr. Max! Did he dress up for Halloween this year? I recently saw you in a magazine, so had to but it because I love your quilts! This is one of my favorites! It is gorgeous. Love the background and the quilting! An amazing job!!! Ashley, since you had to do it so much in this quilt, I am wondering if you have a good technique for the “burying of threads.” I have tried to find online tutorials and they seem SO complicated, so I have shied away from any quilting lines that don’t start and end at the edges of my quilts! If you have any tips or tricks, I’d LOVE to hear your opinions! 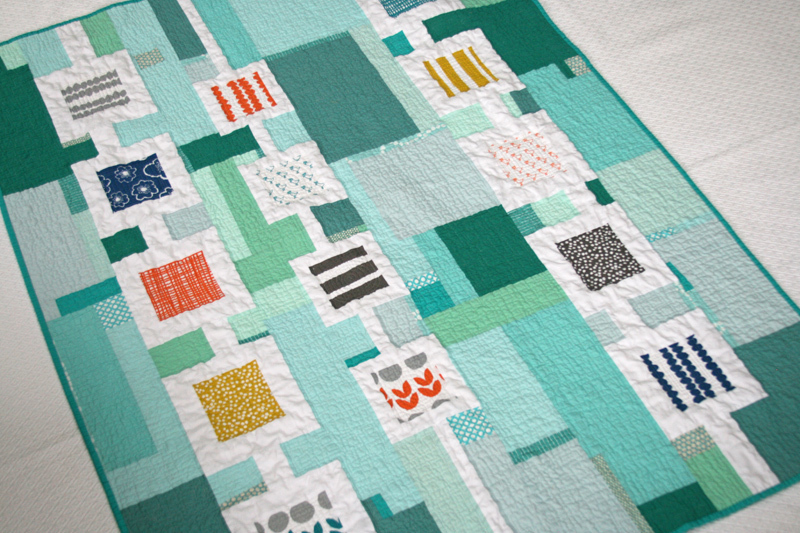 On a side note, your quilts are such an inspiration to me! I’m so happy there are so many amazing modern quilters out there bringing new life to the art (esp for new/young quilters like me). Thank you for sharing your awesomeness on your blog! I check your blog and saw this post. I am just getting started in quilting and am really drawn to the more modern improvisational piecing. I want to make this quilt using a different color scheme and wanted to know if you think it would work. 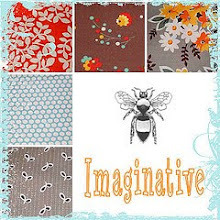 The charm pack I have is Zen Chic Comma and I want to use a dark grey instead of the white to surround the charm and different shades of oranges instead of your turquoise background. I am not sure if you read older post comments or even respond to this time of question/comment, but if you do I would to hear what you think. Cant find you on CardsApp. Whats your cbn? I know that you said you did not use a pattern for this, but I absolutely love the design and would love to make it for my first child’s nursery! Do you have any notes or even rough pattern that you’d be willing to share or sell to me? In love your work!